Since the ad failed to hold my attention, I'll go on with my business and ignore this ad. But you already know what is going to happen next. I did click on the ad, it brings me to their Facebook landing tab. Now I know what the brand is about--GOATS. No, wait a minute. Why would anyone sell goats on facebook? Let's scroll down to see what kind of goats they have on sale. It's a clothing sale? And I thought they were selling goats! 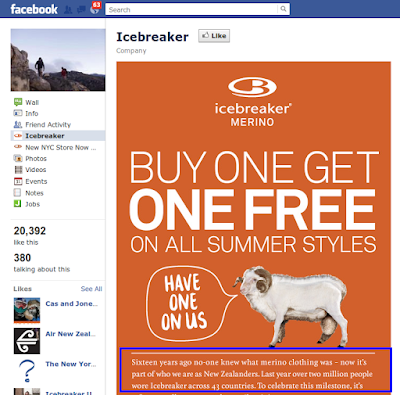 For the Facebook ad headline, the advertiser should have used something else, like "2 For 1 sale". As for the image, an image of a person wearing their line of clothing with a second person admiring that person from afar. The landing page can still be improved. The 20k likes on the page doesn't count for much. We all know it's easy to buy 10,000 Likes for your facebook fan page. I didn't know what this brand was about, neither did my teenage kids. Since it's a line of clothing, use an image that I suggested above, or similar images of person/s having a grand time wearing their line of clothing. What does the brand stand for? If it were quality, then the image used on the landing tab could be something to convey that quality. A goat--that's how it looks to the average person, does not tell a lot. Were the material made for this line of clothing made from wool? I am sure you can come up with a better image telling that story. 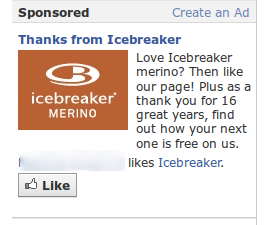 The logo and "Icebreaker Merino" should be moved some place else. The Facebook page already tells people about this brand. Keep the "buy one, get one free" right where it is, but insert "17 years..." as a caption above.